Googly Srabanti & Soham hakraborty Movie 2019. In 2019 is upcoming Kolkata Bengali movie Googly. Googly movie Directed by Abhimanyu Mukherjee. It’s an romantic thriller based Bengali movie. It is the second movie of Abhimanyu Mukherjee. His first movie was Piya Re with Srabanti Chatterjee and Soham Chakraborty. Googly upcoming movie starring by Srabanti Chatterjee and Soham Chakraborty. They are playing lead character in this movie. Recently successfully launched Soham Chakraborty and Srabanti Chatterjee paired movie Piya Re. Now they are together busy to this movie. Soham Chakraborty & Srabanti Chatterjee first paired up movie was Amanush directed by Rajib Kumar Biswas. Their others released movies were Faande Poriya Boga Kaande Re, Shudhu Tomari Jonyo, Jio Pagla and Piya Re etc. And their upcoming paired up movies Googly, Bhootchakro Private Limited and Nabajiban Bima Company etc. Produced by: Not yet announced. Starring by: Srabanti Chatterjee, Soham Chakraborty and more others. Film Industry: Tollywood Film Industry. Already Abhimanyu Mukherjee directed upcoming movie Googly onscreen captured in continue. Firstly the movie shooting captured started on Tollywood Film Industry. Mentioned that will be 40 percent shooting captured has been done. When Release date of Googly Srabanti & Soham Chakraborty Movie 2019? 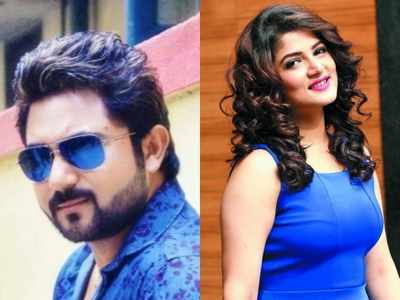 Srabanti Chatterjee & Soham Chakraborty upcoming movie Googly will be released on next 2019. The film director and production house not yet announced that released date on Googly Bengali movie. May be this movie will be released on next April 2019. Dear visitors we are try to update news published here. If you wants to get regularly entertainment news such as Movie, Natok or Drama, movie trailer, movie reviews, movie release date, song release and all entertainment news etc. So lets to enjoy by update media news must be stay with us. So if the site likes then share to others. And best of luck upcoming Googly Srabanti & Soham Chakraborty Movie 2019.